From the main window, select Metadata Browser from the View menu to open the Metadata Browser. The Metadata Browser is composed of a navigation pane on the left and a display pane on the right. Click an item in the navigation pane to see its elements in the display pane. The table below explains the three navigation buttons at the top right of the navigation pane that help you browse the metadata. Add/Open button. Use to add a new server or open metadata files. Delete button. Use to remove a server definition from RETS Connector. Save Metadata button. Use to save a metadata file. Import button. Use to import server settings. Export button. Use to export server settings. Test connection button. Use to test a server connection. Print button. Use to print the results of a metadata comparison. 1. From the Metadata Browser navigation pane, click SERVERS. 2. Click the Add button at the top left of the navigation pane to open the Edit RETS Server dialog box. 3. Use the Edit RETS Server dialog box to add the new server (see Adding and Editing Servers). 1. From the Metadata Browser navigation pane, click the name of the server whose settings you want to edit. 2. Click the Edit Server Settings button at the top left of the navigation pane to open the Edit RETS Server dialog box. 3. Use the Edit RETS Server dialog box to edit the server settings (see Adding and Editing Servers). 1. From the Metadata Browser navigation pane, click the name of the server you want to delete. 2. Click the Delete (“X”) button at the top left of the navigation pane. When you test a server connection, RETS Connector attempts to log on to the RETS server and download a small part of its metadata. RETS Connector then displays the communications log in a new window; any failures are noted in the log, which you can use to diagnose connection problems. If there were no connection problems, Successful appears in the status line. 1. From the Metadata Browser navigation pane, click a server name to select it. 2. Click the Test Connection button at the top left of the navigation pane. RETS Connector displays the results of the test in a new window. RETS Connector automatically checks for metadata changes on the RETS server and loads new versions when needed. If you wish, however, you can manually request a server’s current metadata at any time. 1. From the Metadata Browser navigation pane, click the [+] next to a server name to expand the navigation tree. 3. Click the Refresh Metadata button at the top left of the navigation pane. It may take some time for RETS Connector to download and rebuild the metadata. 3. Click the Save Metadata button at the top left of the navigation pane to open the Save File dialog box. 4. Specify a location and name for the metadata file. You can schedule saving metadata as it changes on the server, if you make it part of a task (see Log File and Metadata Storage Settings). 1. From the Metadata Browser navigation pane, click FILES. 2. Click the Add/Open button (+) at the top left of the navigation pane to open the Open File dialog box. 3. 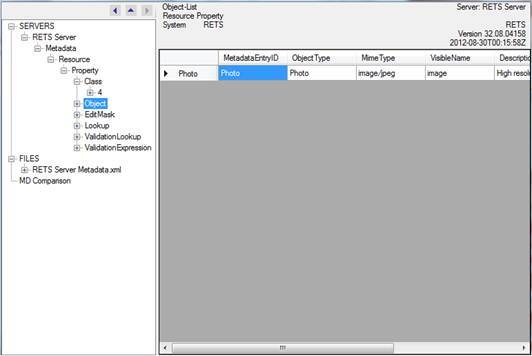 Use the Open File dialog box to locate the metadata file you want to open.